On March 14, 2014, at public hearings in the town of Mogocha, located in Zabaikalsky Province in eastern Russia near the border of China, local people endorsed an ambitious plan to develop a nature reserve on 330,000 hectares. This protected area is being designed to safeguard the upper flow of the Amur River and valleys of its two principal sources: the Shilka River and the Argun River. This area is the symbolic origin of the Amur – the last great free-flowing river that empties from Eurasia into the Pacific some 3000 kilometers downstream. The Argun (Erguna) and Amur (Heilongjiang) Rivers form the Sino-Russian border for almost 3000 kilometers. The Amur river is an important migration route for fish such as endemic Kaluga Sturgeon (Huso davhuricus) which may reach 4 meter length and weigh more than 1000 kg. This river valley is a globally significant biogeographic corridor that allows exchange between far eastern and Siberian fauna and flora. Locals also use the river valley for recreation, shipping, fishing, and hunting. The Amur River creates the border between China and Russia and is home to diverse flora and fauna. Two years ago, Russian En+ Group signed an agreement with China Yangtze Power Co. to develop new hydropower plants, one of which was proposed at the lower Shilka River and that resulted in continued public protests throughout the Amur River Basin for which the Shilka is the primary source. In addition, several years ago, Chinese Xin Ban Guoji Company from Heilongjiang Province began construction of a pulp mill nearby on the Amazar River, which is the large left-bank tributary of the Amur. This presented a grave threat both for the river and for the surrounding forests, because the company rented almost all remaining forests— adding up to 1 million hectares in the Mogocha district of Zabaikalsky Province. Local people hope that establishment of the new nature reserve will protect the river valleys from logging and pulp-mill impacts and prevent construction of the hydropower dam. Their main message to the Zabaikalsky Provincial Government, which sponsors the development of this nature reserve and opposes construction of large hydropower plants, is to expand the new protected area as much as possible safeguarding resources crucial for sustainable development and well-being of local people. The nature reserve was planned and designed on the initiative of Mogocha district administration with support from local scientists, provincial government, WWF Amur Branch and Rivers without Boundaries (RwB). When the hearings are over, documentation has to be prepared so that the provincial government can complete the classification process of the protected area. 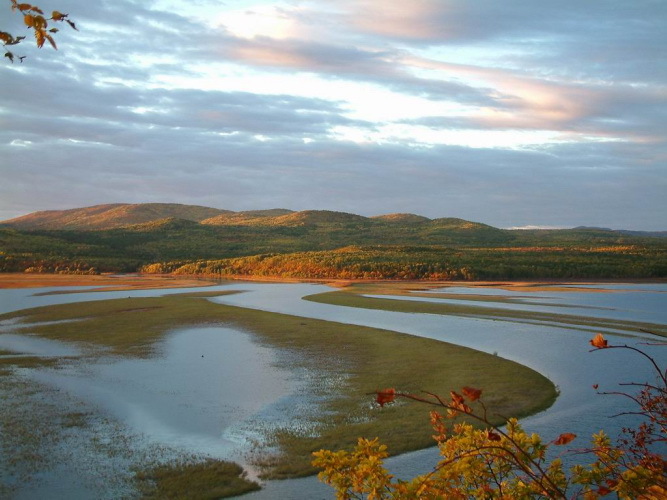 The new nature reserve will protect the Amur River Basin from man-made destruction, including logging, pulp-mill impacts, and the creation of hydropower dams. In addition, 20 Russian environmental groups united by the Rivers without Boundaries Coalition (RwB) signed a petition addressing the Russian government’s questioning of the feasibility of a grand plan to control Amur River floods by building multiple dams on its tributaries (including Shilka River). Such a plan was proposed by President Putin in the wake of a large flood that hit the Amur in summer 2013. However, the real motive behind it is to make use of public money to support development of export-oriented commercial hydropower. The petition shows that “flood-control hydropower” is a controversial undertaking, which is hardly justifiable on economic and environmental grounds. Even the Russian Ministry of Energy publicly expressed doubts that these dams are feasible unless Chinese investors pay for their construction and guarantee buying generated electricity for a fair price. RwB and its allies suggest considering an alternative comprehensive plan focused on investment into climate adaptation and modernization of settlements in the Amur river valley, which will guarantee improvements for local people and drastically reduce losses from inevitable future floods. Such measures cost less and could be implemented much faster than dam building. Environmental groups urge the Russian government to use their recommendations to revise the current approach and make the resulting “anti-flood program” subject to public hearings and strategic environmental assessment. On the 17th International Day of Action for Rivers, Rivers without Boundaries Coalition (RwB) congratulates friends and colleagues who protect other rivers around the world, and hopes that our efforts will save them from destruction!! !